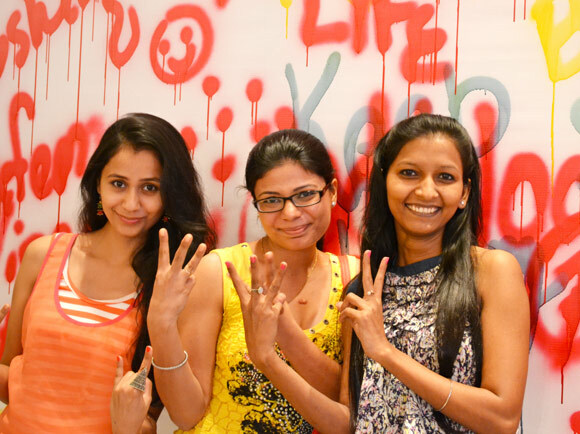 Expressions Of Life..: Pampered by Panteen & Indiblogger! 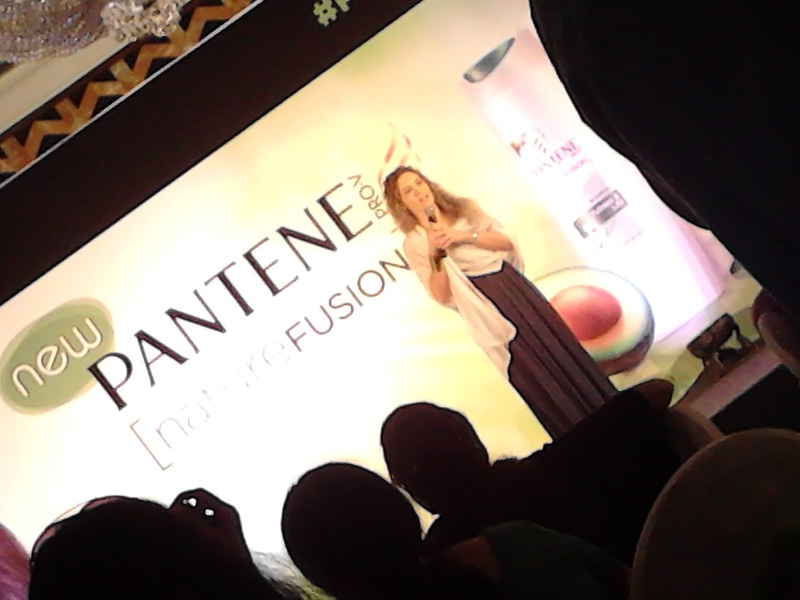 "Pantene & IndiBlogger bring you an afternoon of fun, relaxation and blogging! 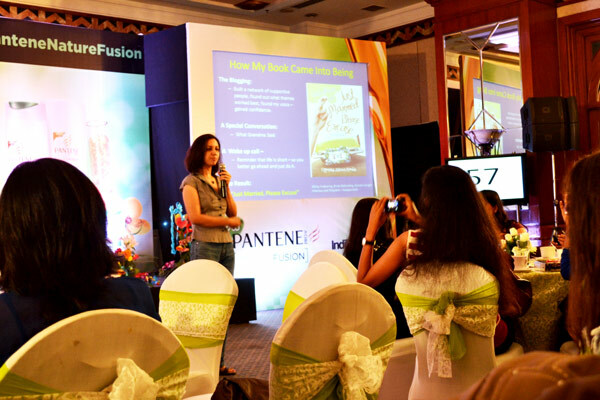 Let your hair down and kick your feet up at the Pantene Nature Fusion IndiBlogger meet. Come over and celebrate the fusion of Nature & Science with us. Trust us, you wouldn’t want to miss this one. " 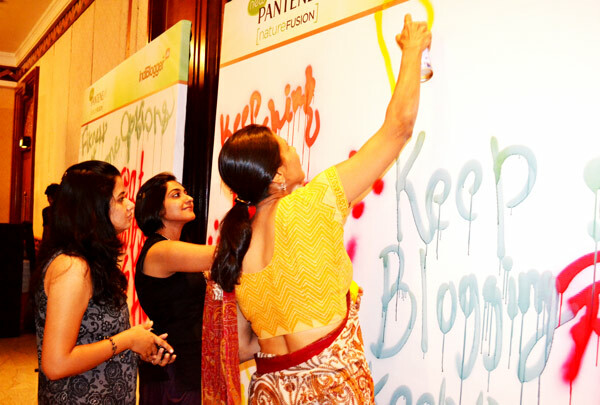 Pantene organised a blogger meet in association with IndiBlogger on 14th October at ITC Sheraton. I was confused whether to attend the meet or not as I just had one day off from my office. And after attending the meet, I was happy that I went. It was one of the best blogger meets I’ve attended until date, and the very first Indiblogger one. 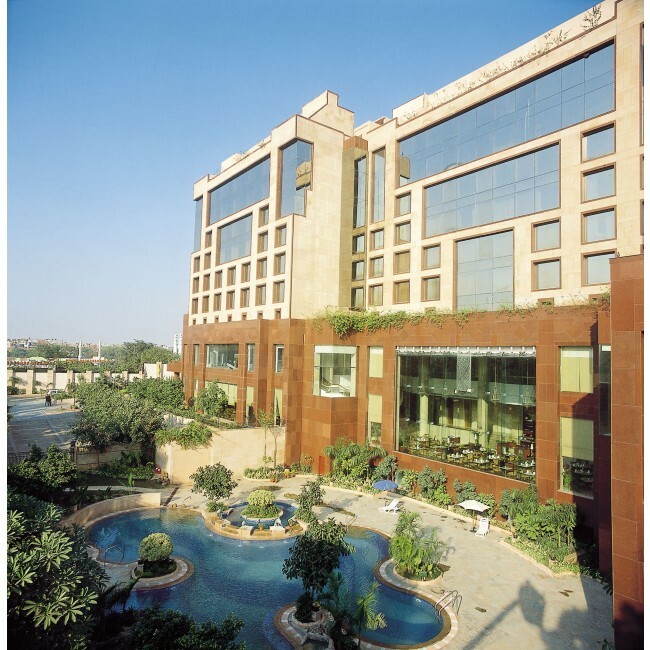 I was gobsmacked as I entered the ITC Sheraton . As I entered the lobby, the first thing that stucked my mind was the amazing interiors full of fragrance of flowers and then was guided by the soft spoken staff of the hotel. As usual I was lost in my own world and full of excitement, I entered the Ballroom and realised I was not so late, but there were few women already present there. I registered myself and got a paper with number '37' which was my number for my hair spa. It was a pleasant surprise (thank you team for this wonderful surprise). Believe me since we all bloggers entered, the whole meet was full of surprises. I could not stop myself gazing at the graffiti wall filled with the spray paints. As we settled down, the meet started with one of the surprising activity (told you the whole meet was full of surprises), there was a balloon under our chairs and toothpicks on the table. We had to save our balloon and prick others balloon. It was so much fun I tell you. My balloon got pricked in the starting itself but I got the prize for pricking most of the balloons. It was very much interesting! As soon as we finished this game, we were divided in to a team of 8 members and had to wrap one of the member as MUMMY. We just had 5mins. to wrap them. 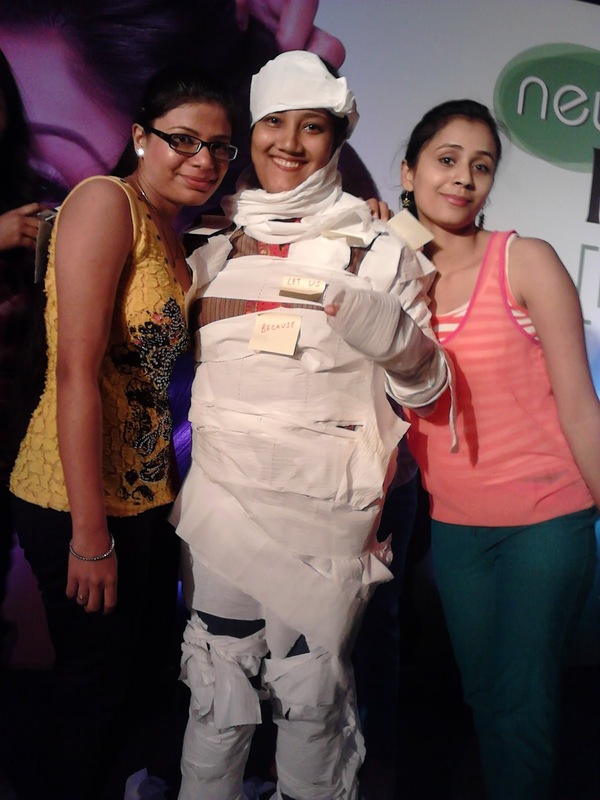 Our team's Mummy was wrapped bit shabbily but my tweet saved Atula (the Mummy) from being eliminated. Blogger introductions was something I was looking forward to. Getting to know other women and the stuff they write about was the best part. Right from women who wrote on life, relationships, cookery, traveling to women who wrote on technology, game designing, mom blogs and even art! It was so delightful knowing my fellow bloggers! It was such a pleasure meeting all of them Eshna, Medha, Vandana, Kiran, Priya, Priti, Anukriti, Anisha and it goes on. Special thanks to Priti for the wonderful pics you had send. Appreciate your efforts. And then it was our turn to have our lunch. 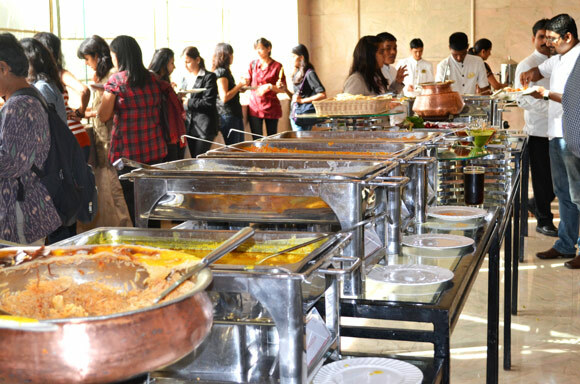 Trust me the food was so yummilicious and tempting. Just after our lunch a short talk was followed by Lais Koelle explaining the fusion of nature and science. It was again followed by a surprise. A box was kept under the table which had a shampoo and a conditioner. There was a Ques & Ans session with her in which she gave remedies for hairfall, dandruff, breakage, etc. And Pantene is for oily hairs hairs too. So all you girls who have oily hairs like me, get ready for using the best oil free shampoo ever with a fusion of nature and science. And then comes next Yashodhara Lal, the author of ‘Just Married, Please Excuse'. She motivated us to write as much as we can by taking out time from our busy lives. And she has a contest going on for all the inspiring writers to get published by sharing your story. 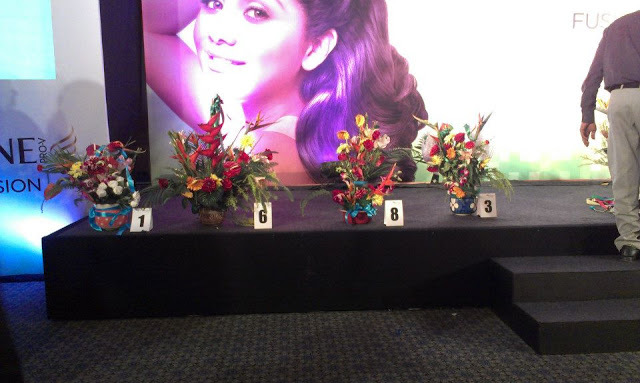 Now after the talk sessions, we had last but not the least Flower Arranging Competition with a unique element which was provided in the bag given to us. Unfortunately, I had to leave this in the middle as it was my turn for the hairspa (for which I was early waiting :p). I didn't want to leave this wonderful competition but it's ok as I could not compromise with my hairs :p.
Don't have words to tell you about my hair spa. Aaaaah, simply amazing! And extremely relaxing! Was pampered so well. A blow-dry and styling followed. The shampoo had such an amazing fragrance and was absolutely wonderful! Made my hair super smooth and super silky! You know that feeling when you touch your hair and you feel like doing it over and over and over again? That’s what I’m talking about! THANK YOU Pantene for such wonderful hairs. And really at first instance I could not believe that they were my hairs. And here comes the end of the blogger meet. But no, we had a surprise here too!! We were given gift hampers from Pantene and a shirt from IndiBlogger with their slogan on it . The wonderful hamper by Pantene! This was one event I’ll never be able to forget! A Sunday well-spent, after ages! 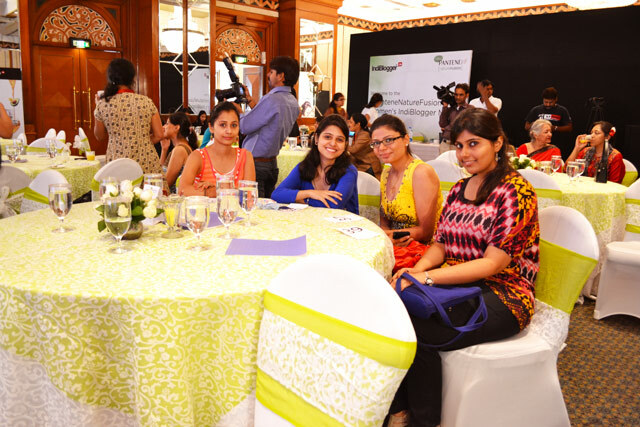 Thanks IndiBlogger & Pantene for their hard efforts for organising such a successful meet. This blogger meet also gave me the chance to bond with my fellow bloggers. Eagerly waiting for the next meet to happen now. Thank you again for the meet and awestruck surprises. Here are few pics which my friend Priti took it while departing! 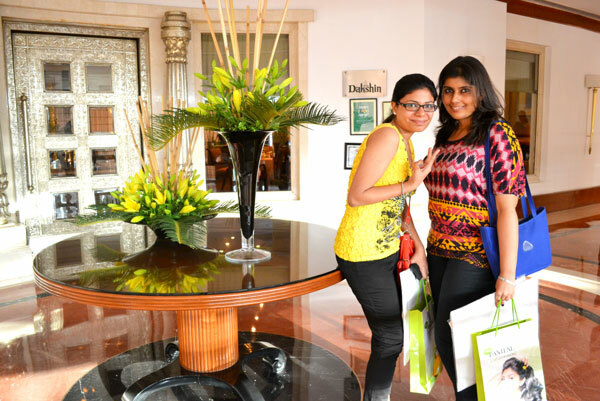 Me and Medha posing for the shutterbugs! Yes Jay had an amazing time in the meet. Unfortunately I don't have extra booklight. Yes it's too unique. I loved it. All credit goes to you my dear. Wow mouse pad too sounds great. The meet was worth spending time and letting know each other. Love ya. Hugs !! 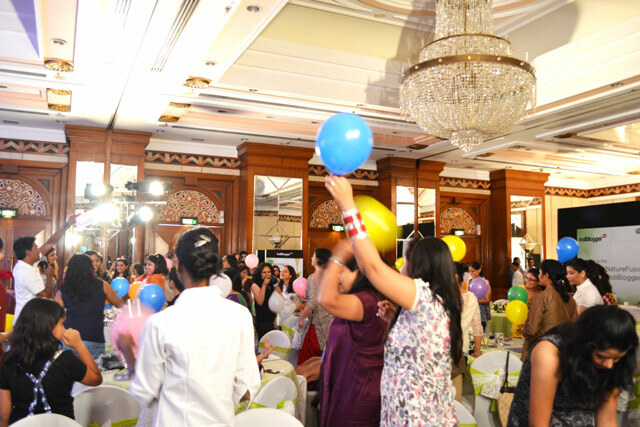 Thats me, with chuda in hand in the pic above , scuttling here n there saving my ballon in the crazy balloon game.. It was absolute fun... nice pics dear.. njoyed ur post. Hey I am sorry, missed meeting you! Yes it was so much fun during all the activities. it was my 4th indiblogger meet and as always I loved it! !..it was nice to see you..though I did not get to talk to you directly!! Wow great 4th blogger meet. 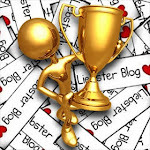 hey its a nice post and nicer seems d time u spnd there .... gud to read u ftr so long ... kp writing .. !! Yes I loved being there at the meet! Wish you would have also been there. Yes!! 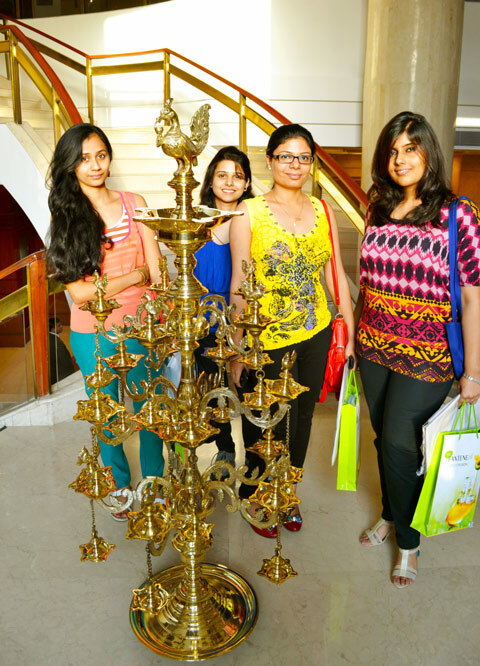 Loved meeting the fellow bloggers and never thought that the meet would be so interesting and full of surprises.